Today is the day before Thanksgiving here in the States. 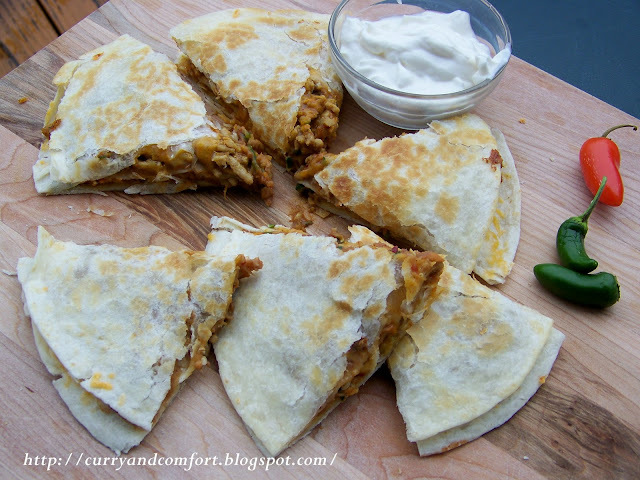 Amidst all my cooking for the big holiday tomorrow, I wanted to make the family a quick lunch and decided on quesadillas. This time I wanted to make them a bit more substantial so I decided to load them up with some veggies not traditionally found in quesadillas and some beans. To make the quesadilla a little more interesting I also decided make it a triple decker. 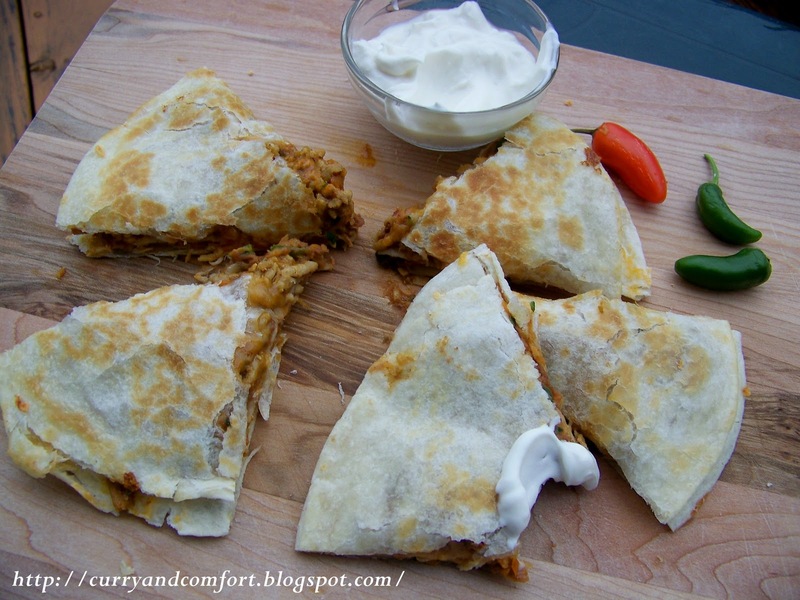 These quesadillas were a big hit with some sour cream as a dip. I think the quesadillas will never be the same in our house again. 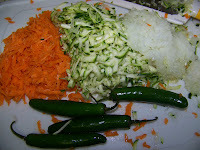 1st grate your vegetables and have all your spices ready. 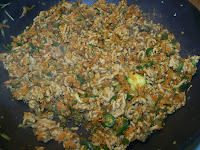 Next brown your ground meat in a large pan. 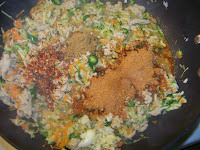 Then add your grated vegetables and saute for a few minutes. Add your seasoning and mix well. 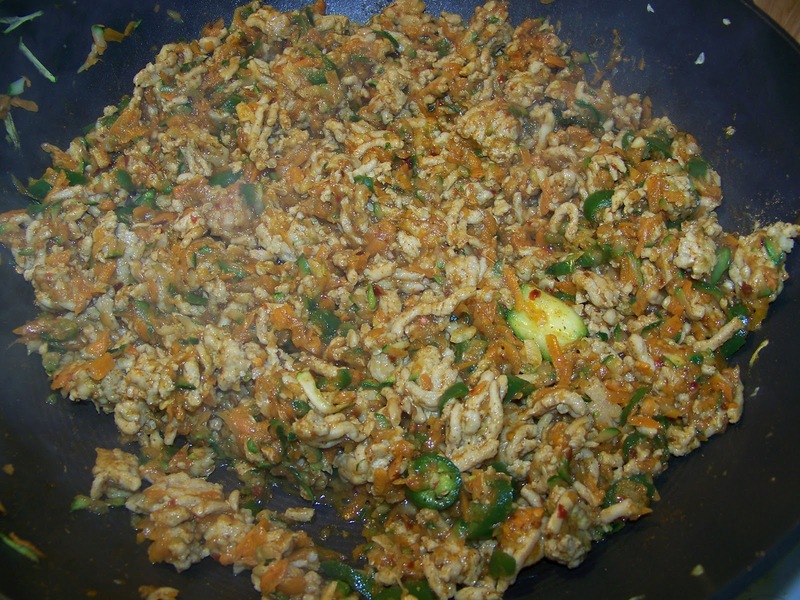 Allow to cook for 7-10 minutes. Taste for seasoning. Turn off the stove. 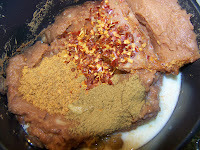 To make your creamy beans, place mashed beans (or can of refried beans) in a pan with 1 tsp of cumin, 1 tsp of taco seasoning, chili flakes and 2 Tbs of milk. Mix well until smooth. side of a tortilla and place it oil side down. 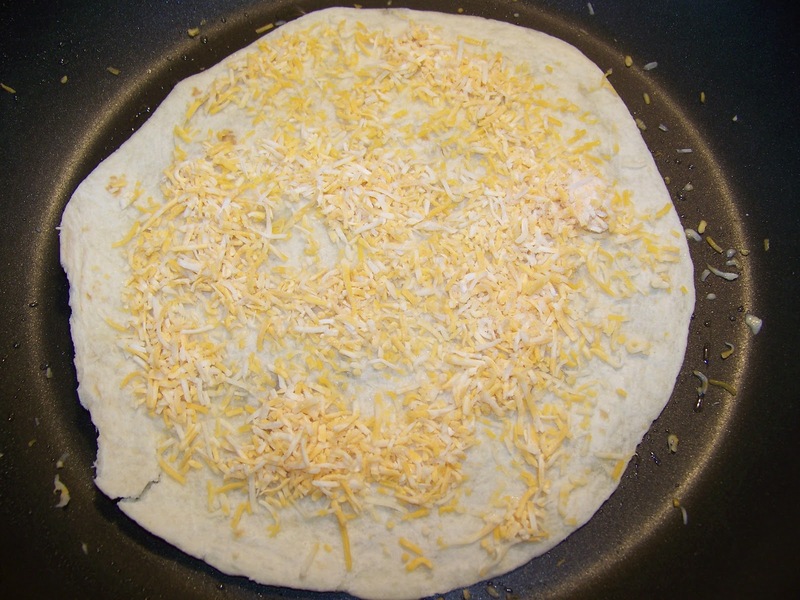 Then place a layer of cheese on top. 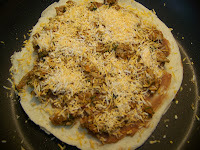 Next put a layer of the meat mixture over the cheese. Take a 2nd tortilla and apply a layer of the bean mixture over it. 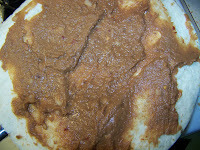 Invert it and place the bean side down on the meat of the first tortilla. Apply another layer of beans on the top of the tortilla side facing up. 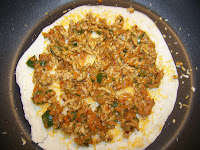 Then layer it with meat and cheese. Place the 3rd tortilla on top and coat the outside with a little canola oil. I like to assemble my quesadilla and have it cooking on medium heat while I finish layering it. Then when I get the top placed over the quesadilla it's ready to be flipped. Gently flip it over using a large spatula. Allow the other side to brown and become crispy. 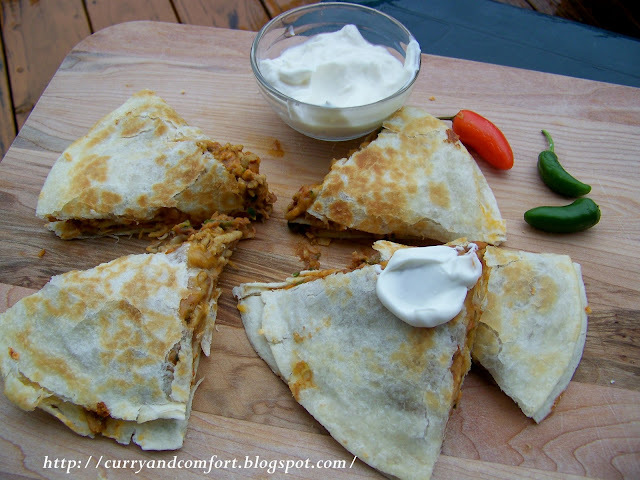 Cut it into wedges and serve with sour cream if desired. Enjoy. Oh man, I am drooling here! I am a huge quesadilla fan. With all that gooey cheese, what's not to love? I like that these are amped up with extra layers like the re-fried beans. I could easily make these w/o the meat. I've never met a refried bean dish I didn't love! This looks great! Ramona - anyone who makes triple-decker quesadillas is a girl after my own heart ;) Looks drool-worthy! Oh, gosh. I wish I were having these for lunch, but now I think I'm going to go get some Mexican food. Wow, I make quesadillas all the time, but never like this! These look pretty awesome! Oh, Ramona! This looks amazing! 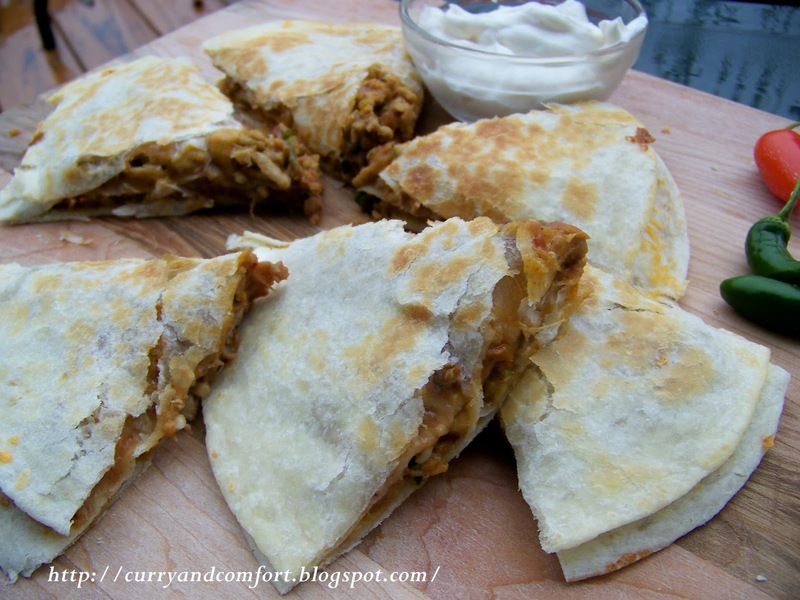 I love quesadillas and it's been a while since I've had one...now I want one! Wow! A triple decker? With veggies, too? These look incredibly tasty. Wow..Awesome dear..First time here..You have a lovely blog..Following u straightaway..
Do visit my blog some time.. Happy Thanksgiving! These look sooooo good. Funny our minds tend to cook similar things! Mexican food! yummy! 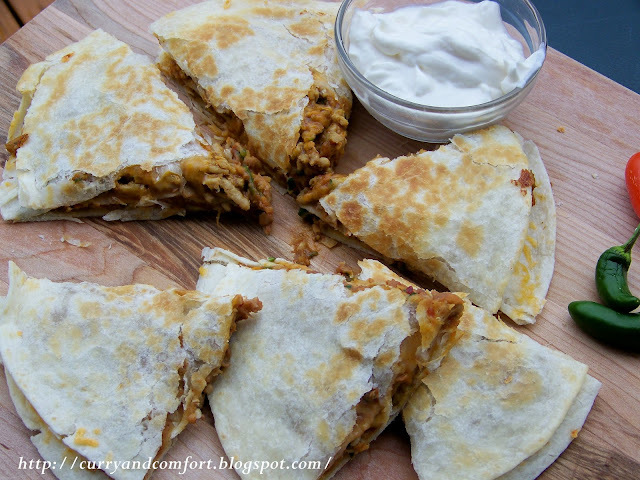 Only thing better than quesadillas are 3 layer quesadillas! Oh man those look good! I'm not sure I'd want to make these for the family because I wouldn't want to share :) I love a layer of veggies though! Great way to get another serving in! These definitely are loaded! Loaded with flavor! Ok, I'm picturing the gloppy mess that it must have been to eat those quesadillas and being jealous of every single plop on the plate that had to be scooped up with a finger. They look fantastic. How on earth did I miss these beauties? We have a huge weakness for Mexican food at my house. My daughter and I were just discussing have a Mexican food buffet for Christmas Eve. Perfect timing!